Under the moniker of Horst P. Horst, German born Horst Paul Albert Bohrmann would photograph the beau monde and Parisian café society of the interwar years. The year Horst would meet Gabrielle Chanel, he took the most memorable and well-known photograph of the fashion designer’s life; an image that came to typify the elegance and enigmatic nature of the designer. Flouting the composition of traditional portraits, Chanel avoided a direct gaze with the camera, much like she did with inquiries on her childhood and upbringing. Although taken years earlier in 1937, the portrait was first published in the February 15, 1954 issue of Vogue. Karl Lagerfeld would photograph Kendall Jenner in the same vein for Vogue‘s September 2015 issue. 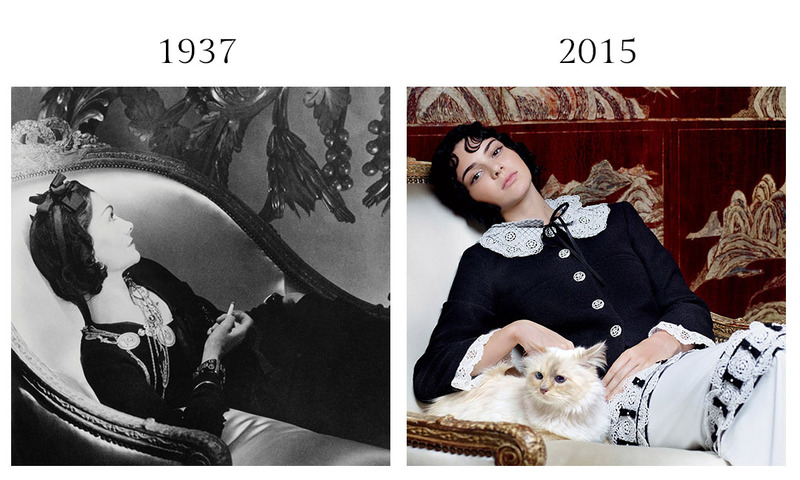 Kendall Jenner and Choupette by Karl Lagerfeld for Vogue September, 2015.